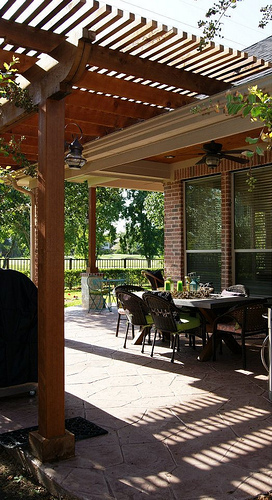 Photo of a pergola attached to a house by Texas_Custom_Patios/FLickr. The look of a pergola attached to a house can be quite stunning, extending livable space while creating a connection between the indoors and the outdoors. Installing a pergola and fixing it to the side of a residence will add both enjoyment and value to your property. whether you DIY or outsource the work to a local carpenter, the project can be done in a weekend or two. For a more elaborate pergola installation, consider upgrades like a surrounding patio, an outdoor kitchen, or attractive landscaping. Here's what you need to know. Pergolas create a shaded walkway or sitting area by supporting a lattice on heavy beams and posts. When attached to a house, a pergola typically features two or more posts along the end that juts out, while the other end anchors directly to the home. However, if the structure of the house doesn’t permit this, additional support posts may be sunk as close to the house as possible for the frame of the pergola. Beams between the posts create the support structure for a framework that can be left plain or used as a lattice for plants. Historically, pergolas were often installed as standalone garden features, planted with climbing vines. They created a pleasant place to walk or sit, allowing people to enjoy the garden while getting some shade from the sun. When a pergola is attached to a house, the pergola becomes an extension of the residence while simultaneously bringing the garden indoors, creating a sort of between-space. As an outdoor recreation area, it can be great for barbecuing, dining, and other activities in the summer months. Often folks add a fire pit, built-in grill, or outdoor kitchen. Thanks to the protection of the pergola, you can set out nice patio furniture can be installed to allow people to sit, play games, and nap. Landscaping can provide additional cover (and sensory appeal!) with riots of blooming scented flowers as well as low-slung ornamentals. For those considering property values, installing a pergola is a fast and inexpensive way to add value. It also extends the usable and livable space to the house, which can be an advantage if people are feeling crowded, and creates a space for people to enjoy the garden in a more structured area. Furthermore, for those who entertain frequently, a pergola attached to a house can be a good strategic addition to their home. The benefit to installing a pergola personally is that it will be a lot less costly, but it does take a certain level of skill, and may require a permit in some regions. Do-it-yourselfers will have to start by digging holes for the supporting posts, filling them with concrete, and installing metal anchors or installing the posts directly into the holes. Once the concrete sets, you can add a heavy beam to connect the two posts, while other beams extend back to the home. You'll need hardware brackets rated for high weight for this. After the framing is in place, smaller crossbeams can be installed to create the lattice of the pergola. Many people cut the beams on the end to create decorative end caps, a feature you may want to consider to make the pergola more visually interesting. It’s also possible to buy pergola kits made from wood or plastic. Before buying a kit, make sure the dimensions would fit with the area you have in mind. Kits generally save time when it comes to installation because all the pieces come precut, with clear step-by-step directions. Companies that specialize in landscape design and outdoor contracting can install a pergola attached to a house as well, which is an option for homeowners who don’t have the time or skills to do so. Although it will be more costly than doing the work personally, there are several advantages to hiring an experienced contractor. You'll get professional design and craftsmanship, together with the assurance of insured and bonded work.